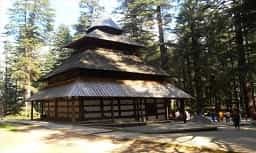 After fresh up, proceed to half day city tour of Manali sightseeing (Hidimba temple,vashist Temple hot spring water, van vihar, the mall road and Tibetan Monestry). Overnight stay at hotel inManali. After taking early morning breakfast, ready for full day sight seeing of Solang valley&Rohtang pass. Over night stay at hotel. 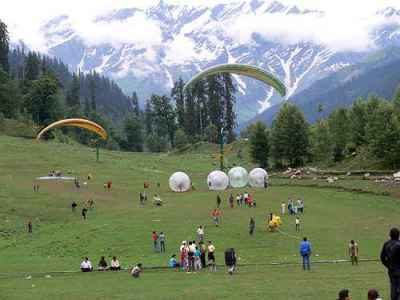 About Solang Valley Solang Valley in Manali is located at a distance of 13 kms in a side valley at the top of the Kullu valley is a splendid valley between Solang village and Beas Kund. 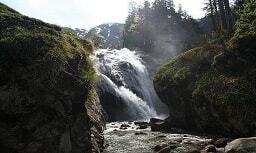 Solang valley offers the view of glaciers and snow capped mountains and peaks. 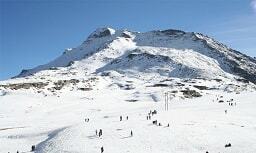 Solang Valley has fine ski slopes. The Mountaineering Institute ofManali has installed a ski lift for training purpose. Located here is a hut and guest house of the Mountaineering and Allied sports Institute, Manali. Now a few hotels have also come up. 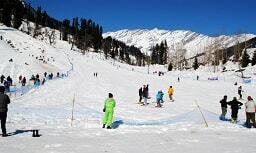 The winter skiing festival is organised in Solang Valley. 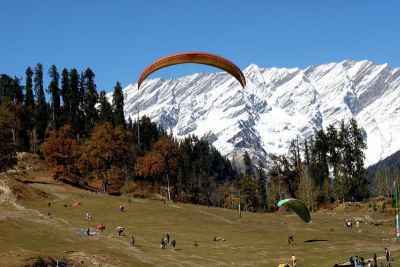 Sking and Paragliding are two main activities are organised here. Apart from this many other adventure sports are available like Zorbing, Horse riding& Snow Motor Bikes riding etc. After breakfast Manali to Naggar Castle and Jana water Falls. ABOUT Naggar Castle "Located in Naggar Town, amidst breathtaking forested hills, the Naggar Castle is a magnificent historical edifice. Made of stone and wood, this palace served as the residence of Raja Sidh Singh of Kullu. It was built in AD 1460 in an impressive amalgamation of European and Himalayan architecture. Fireplaces, fitting staircases, and magnificent stone and wood works grace the castle's interiors. There are three small shrines within the premises, each holding immense religious importance. For art lovers, Naggar Castle has incredible art pieces on display. Worth-mentioning are the paintings of Nicholas Roerich- the famous Russian painter. As souvenirs, you can take home traditional items like wall hangings, coasters and artefacts bearing imprints of Roerich's paintings from here. In the year 1978, the castle was converted into a rest house, and more recently into a heritage hotel that is run by Himachal Pradesh Tourism Development Corporation (HPTDC). 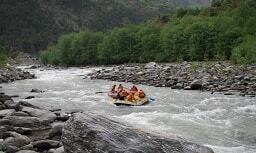 The holy Beas River flows close to the castle, adding beauty and sanctity to it. 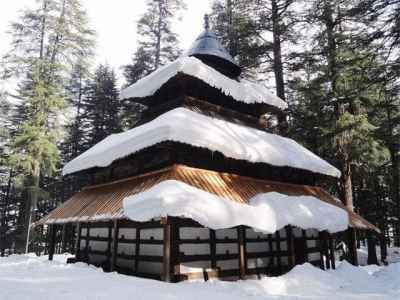 No trip to Manali is actually complete if you don't pay a visit to this attraction."